Trying the WebGL enabled version of Google Maps with Chromium browser. [ 353.425] [mi] EQ overflowing. Additional events will be discarded until existing events are processed. [ 353.426] [mi] These backtraces from mieqEnqueue may point to a culprit higher up the stack. [ 353.426] [mi] mieq is *NOT* the cause. It is a victim. [ 354.097] [mi] EQ overflow continuing. 100 events have been dropped. I have the same problem on a Thinkpad X1, running precise. For me, setting INTEL_HIZ="0", as mentioned in the linked bug report, stops the lockup in webGL. INTEL_HIZ="0" also works for me. Confirming that disabling Hierarchical Z stops the hang. However, overall MapsGL performance is uninspiring. Probably Google's fault since its still experimental. MapsGL is also uninspiring on my MacBook Pro with a discrete NVidia card. It's definitely Google's fault. Maybe we're lucky and one of the SNB workarounds fixed this. Can someone try the latest kernel from my drm-intel-next-queued branch? Strangely, i seem to experience this bug (at least, apport sent me here) most often (not every time) when LibreOffice.org is suggesting a word... On Ubuntu 12.04 testing, up-to-date. A few days ago, this would hang my system, requiring reboot, but now it recovered. I just gave drm-intel-next-queued (a360bb1a83279243a0945a0e646fd6c66521864e) a try (running with mesa 8.0.2, libdrm-2.4.33 and xf86-video-intel-caf9144271a10f90ea580c246b2df3f69a10b7a0 ) and I'd say the situation definitely improved. I got one initial hang when using google maps, after that it ran almost smooth. Previously every single zoom on the map caused yet another hangcheck_hung entry. Except now I'm *constantly* getting the crash notifications. They won't go away. I don't have the option to "Don't offer to report this crash again" like I normally do, and this is getting massively frustrating, even after reboot. I get asked several questions, even if I untick "Send an error report to help fix this problem". If I tick it and try to send an error report it sends me here. Anyone care to try it out? I'll put together a kernel patch soon. I can confirm it works, for me at least. It turns out that Daniel already implemented a workaround for this in the kernel...but the register write isn't sticking. Apparently this register needs to be written later in the initialization process. A patch was submitted to intel-gfx yesterday: "[Intel-gfx] [PATCH v2] drm/i915: Set the Stencil Cache eviction policy to non-LRA mode.". I have tested this patch on top of the precise kernel 3.2.0-24-generic. Googleearth no longer freezes when zooming in. The patch is currently on it's way to Linus and stable. drm/i915: Set the Stencil Cache eviction policy to non-LRA mode. by default, but seems to be on for many machines. reverts to the old one). The patch mentioned above by Albert has been included upstream in kernel 3.4-rc5, and cc'd to stable. Works a treat. Thank you! Will kernel 3.4 (or at least the fix for this bug) make it into precise at any point? Sorry if this is a stupid question. 3.4 won't get in precise, but we can backport fixes to the 3.2. 3a69ddd6f872180b6f61fda87152b37202118fbc drm/i915: Set the Stencil Cache eviction policy to non-LRA mode. Actually, that commit is already in the kernel in precise-proposed (3.2.0-25.40), so please test with that kernel! I tested 3.2.0-25.40 on a duplicate bug and it worked. I also just verified that Google Maps ( the WebGL version ) works without issue in Chrome with that same kernel. proposed 3.2.0-25.40 is also working for me. Tested webgl maps in Firefox/chromium & google earth. thanks, marking as fix committed! Closing as fix released, since the new kernel is now available in precise-updates. If you still have gpu hangs, please file a new bug. Yeah baby! This is what open source is all about. Thank you all! > Yeah baby! This is what open source is all about. Thank you all! > Trying the WebGL enabled version of Google Maps with Chromium browser. > dmi.bios.vendor: American Megatrends Inc.
> dmi.board.vendor: ASUSTeK Computer Inc.
> dmi.chassis.vendor: ASUSTeK Computer Inc.
> dmi.sys.vendor: ASUSTeK Computer Inc. I also have this issue with my Intel-I7-2600 based PC. The board is a original Intel one. 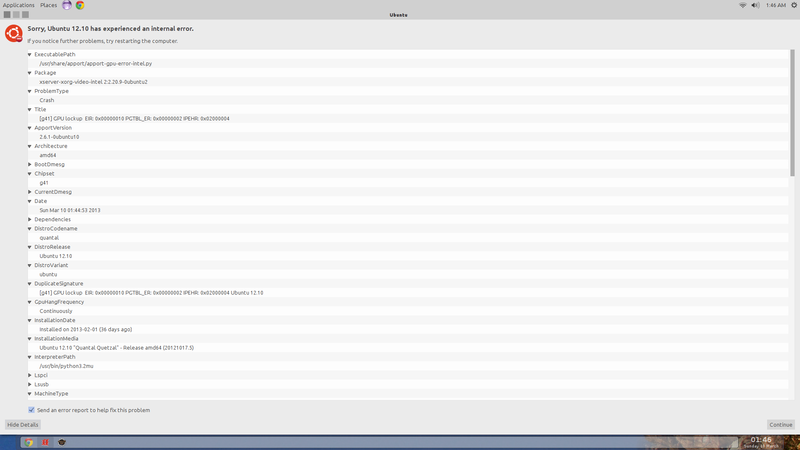 With Ubuntu and Unity or Gnome (even Gnome in 2D mode) i get random lockups of the complete PC. It does not matter if i do anything or if i just leave the PC alone. If i do not login to Gnome or Unity the PC does not hang. So i tried XFCE4 and there i do not get any lockup as well. Just from time to time i get the crash of the script mentioned above. This lets me assume Gnome and Unity cannot handle these GPU lockups but XFCE does. Just the current window hangs for some seconds short before the error message appears. BTW: I am running 3.6.2-030602-generic at the moment because i had several kernel-oops with the original 3.2 kernel of Ubuntu 12.04LTS with this PC (also after updates). These do not occure with 3.6.2. Thats apparently a different problem. I think I will try with XFCE instead of Unity. There appears to be a regression, at least on my machine, the GPU started to lock up randomly (some gnome shell actions, namely the hot corner, cause it more likely than general usage) after longer usage and previous suspend to disk/RAM. It seems not to appear if no suspend has been done before. [ 21840.621] [mi] EQ overflowing. Additional events will be discarded until existing events are processed. [ 21840.688] [mi] These backtraces from mieqEnqueue may point to a culprit higher up the stack. [ 21840.688] [mi] mieq is *NOT* the cause. It is a victim. Note: The mentioned workaround did not work for me, and i have also encountered IPEHR 0x01000000 (https://bugs.launchpad.net/ubuntu/+source/linux/+bug/978968), even without suspend to disk/ram. LibreOffice spell checking appears to trigger the problem sometimes. Here do I the same.